But water once brings danger near. The rocks themselves a source of fear. Flight from there to no avail. Death comes from a final fall. The flash of flames around Richard engulf him, but last too briefly to burn him. The flames eventually begin to die down, giving Richard a better opportunity to search the flames for the missing amulet. His search lasts longer than he wishes, and soon he starts to think he'll never recover it, when suddenly he spots something hanging from a nearby tree branch: it's Golan's amulet, which had been blown away by the blast. Richard reclaims the amulet and discovers it still feels hot, before he rejoins his friends. Richard waits for the amulet to cool enough before he uses his tunic to clean it. Unfortunately the amulet appears different and lacks its usual spark. Thinking the fire had ruined the amulet's powers, Richard hopes the amulet will regain its magic eventually. With the amulet back safely, the trio continue on their journey, moving out of the forest towards a series of rocky rapids. They cross several power currents using giant boulders, and upon getting on the other side safely, Melek reads the Book of Prophecies. 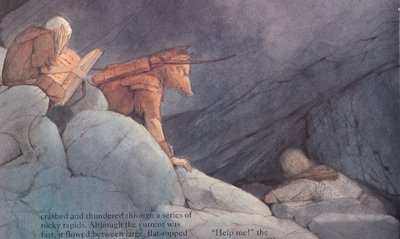 Richard quietly suspects that they need to cross water three times for the amulet to regain its powers, and for Orkan to cross it twice for him to return to normal. Suddenly, a voice from nearby calls out for help. He looks around and see nothing, so he calls out for the voice to identify his location. The voice states he is under the boulder Richard is sitting on. Sliding down tbe boulder, Richard finds a small gap between the rock and the ground. 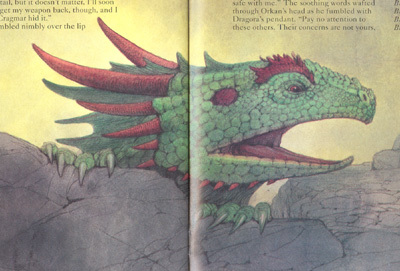 Richards asks the owner of the voice who is he; the voice identifies himself as Zard, Guardian of the Reptiles, and asks Richard if he can get him out. Richard and his friends respond by trying to push the boulder to widen the small gap, but the rock doesn't burge. Using a piece of driftwood as leverage fails when the piece of woof snaps. Before they can ponder what to do next, the ground starts to shake as something downriver begins to stir. 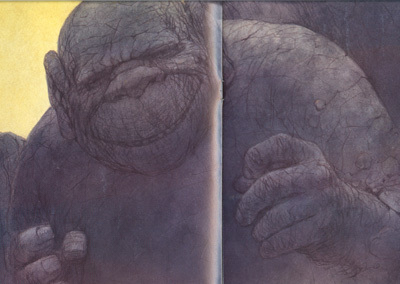 The three turn to see a giant man made of stone emerge from the rocky bank, noticing the trio near Zard's prison before grinning. 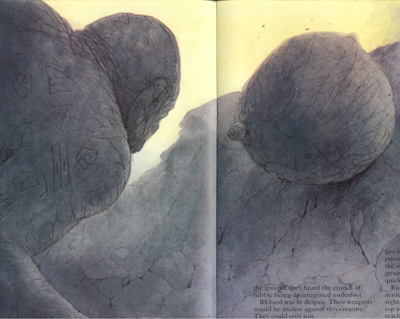 The stone man begins to move towards the three, his feet thundering across the ground. 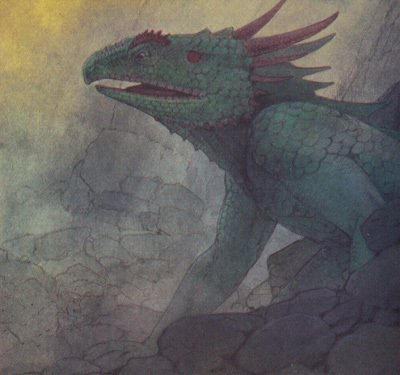 Zard shouts at them to run from Cragmar, who won't harm Zard as long as he's still imprisoned. Richard looks around desperately, and sees a large boulder balanced up on a slope with three tiny rocks. Getting an idea, Richard orders his friends up the slope. Orkan and Melek rush up the slope while Richard remains by Zard's prison to get Cragmar's attention. Cragmar apparently grows irritated and quickls his pace. Richard quickly ducks behind the boulder and rushes up the slope to join his friends. When Cragmar arrives by Zard's boulder, he looks around in puzzlement for his prey. Meanwhile, Richard reaches his friends and quickly explains his plan to them. Cragmar looks up and sees the trio behind the boulder, frowns, and starts up the slope after them. Richard waits for Cragmar to get close enough before ordering the boulder to be released. Because Cragmar is unable to move quickly, the rock appears on target to strike the rock man, but at the least second it strikes an outcrop and bounces off course, leaving Cragmar untouched. But the deflection of the boulder has an unforeseen consequence: the boulder strikes the boulder of Zard's prison, shattering it into rubble. 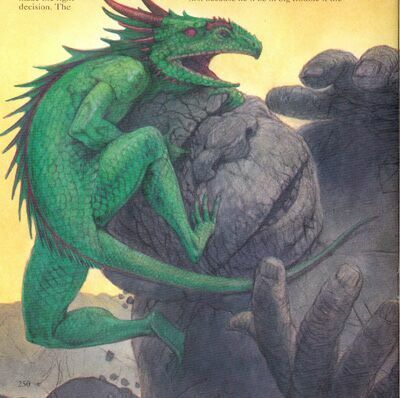 From the remains of the boulder, a large lizard emerges and runs uphill towards Richard and his friends. Cragmar doesn't notice Zard's escape because of his narrow miss from the boulder. When he sees Zard standing next to the trio, however, the man of stone roars in anger and starts chasing the group more zealously. 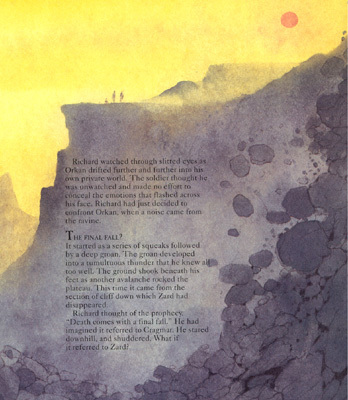 The group begins to run, initially gaining distance from Cragmar, but because of Zard's speed he is forced to halt and wait for his companions to catch up, giving the stone man a chance to regain ground. Realizing running away was fruitless, Zard orders his friends towards a steep ravine. Richard thinks Zard led them the wrong way, but Zard orders them to duck behind a nearby boulder, knowing Cragmar would come after the Guardian first. The trio hide while the Guardian performs a strange dance to taunt his pursuer. Without warning, Zard leaps up onto Cragmar's face when the stone man is close enough. Cragmar, too slow to be puzzled, brushes Zard off his face and reaches for him to grab the Guardian. Zard evades Cragmar's clumsy movements with a quick jump to the side. Undeterred, Cragmar again reaches for Zard, only to have the Guardian evade him again. For a third time Cragmar attempts to catch Zard, only to have Zard to jump away, but this time Cragmar is ready. The stone man's left hand waits for Zard to dodge Cragmar's right hand, and the left hand grabs Zard's tail when the Guardian dodges. But Zard makes a quick motion and jumps over the edge of the ravine, leaving his tail in Cragmar's hand. Cragmar, stunned that his prey had escaped so easily, tosses the tail aside and jumps in the ravine after his foe. A sudden crash erupts from the ravine and dust builds up in the chasm. When siilence emerges, the trio look down the ravine and see an outline of rubble which Cragmar had once been. The stone man had shattered upon impact. The three ponder the fate of Zard when a familiar lizard figure emerges across Cragmar's remains, scuttling up the cliffside until he reaches the amazed trio. Zard explains Cragmar's stupid drive to go after him at all costs, and isn't concerned about the lack of his tail because of his misjudgement. He states he needs to retrieve his weapon, which Cragmar hid but luckliy Zard knows where it lies. He disappears over the lip of the ravine as he sets off to retrieve it. Blood the prize that you can take. Blood! The blood of those you hate! Richard meanwhile watches Orkan and witnesses his friend lapsing into strange emotions because of the amulet. Richard decided to confront Orkan when a loud noise catches his attention. He turns to see an enormous avalanche roar down the cliffside where Zard had disappeared to retrieve his weapon. Richard recalls the words of the prophecy recalling a death with a final fall. Could it have referred to Zard instead of Cragmar? Cragmar is a giant man of stone who was created by the Evil One solely for the purpose of guarding the Guardian Zard. Cragmar's intellect is very slow mentally and he has no weapons to use for fighting, but his strengths make him a reliable guard. 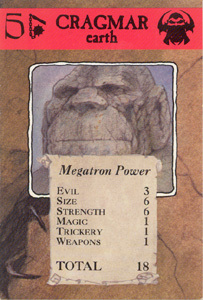 His powerful strength allows him to destroy anything that can't get out of the way, and his stone body allows him to repel any conventional weapons that might hurt him. His slow intellect also renders him unable to be puzzled by an attacker, making him single-minded in any task set before him. 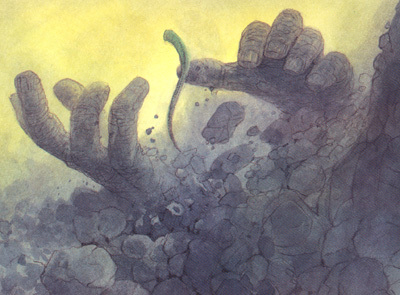 "From deep in the rockface, an enormous figure was struggling to free itself. It thrashed about, clawing at the rock with massive limbs until it finally stood in the open. It was a gigantic man made entirely of stone. His craggy features swivelled about before fixing on the companions. Then he grinned. From where they stood, the trio could hear the grating sounds as the stoneman's cheeks creased. He began to walk towards them. Every time his monstrous feet hit the ground, they heard the crunch of rubble being disintegrated underfoot." Zard is the Guardian of Lizards and the Keeper of the Pod of Justice. 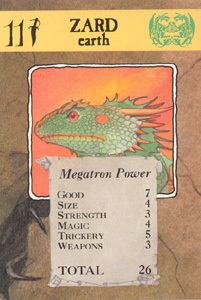 Being the leader of the Lizard Forces, he is naturally a giant lizard. He his remarkably agile and speedy, and if his tail is snagged he can detatch from it with ease with the ability to grow a new one later on. His weapon of choice is a giant twin-sided battle axe. When the Evil One conquered the Ancestral World and Zard set out to seek help, he was captured by the Evil One and placed in the care of Cragmar, who kept Zard pinned underneath a giant boulder for a prison. Another volume, another Guardian. With the sixteenth issue of The Ancestral Trail, Richard and his companions release another Guardian from the clutches of the Evil One, bringing the total of rescued Guardians to three. With the arrival of each Guardian, they each show off their unique abilities and strengths. Juroot, for example, appears to rely on his strength, while Kika prefers using her quick reflexes from a distance. With Zard, he seems to utilize his agility, though this is without his weapon, which will be revealed in the next volume to be a giant battle axe. As the issue's monster, Cragmare proves to be an interesting, potentially dangerous foe despite his slow mind. While he is unable to move quickly, he is invulnerable to attack because of his stone skin, and his slow mind makes him difficult to confuse thanks to his single-mindedness. However, that narrow vision of his ends up getting him killed when he chases after Zard down the cliff, causing him to shatter on impact and die. He made a decent guard for the Guardian when Zard was imprisoned, but as a pursuer he lacked the necessary focus needed to capture someone more agile and smarter than he was. Finally, Orkan's strange behavior begins to grow more disturbing with each volume. 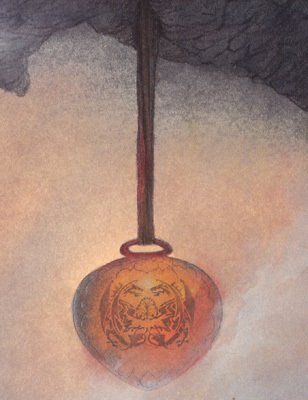 First the amulet made him indifferent to his friends, one who wanted to seek his own fortune and save his own skin whenever danger reared its head. But that has quickly evolved into a bloodlust, a desire to kill those that he hates. All of this accumulates into the poem cited above, a poem that reflects a dark future ahead for Orkan. Interestingly enough, the poem mentions a "Gator", which happens to be the main creature in the next volume of the series. Does this Gator have anything to do with this amulet? "Never mind me! Get away from Cragmar. He's here to stop me getting out. He won't touch me so long as I'm still in the Evil One's prison. Save yourselves!" "Get under cover! Don't mind Cragmar. He'll come after me first because he'll be in big trouble if the Evil One finds I've escaped. You'll be fine so long as you stay out of sight. Meanwhile, I've got a trick or two up my sleeve. Go quickly. Here he comes." Melek: "How did you escape? We thought you were dead!" Zard: "I knew Cragmar was stupid enough to follow me wherever I went. Luckily, being a lizard, I can jump anywhere and not be hurt. What I didn't foresee was that he'd get my tail, but it doesn't matter, I'll soon grow another. I must get my weapon back, though, and I know exactly where Cragmar hid it." "They will never know. You are safe with me. Pay no attention to these others. Their concerns are not yours, their aims are not yours. They are foolish. You are wise. You need have no fear. Death is the only umpire. Victory is given only to those chosen survivors. You are my Chosen One."